If you saw it, you probably haven’t yet forgotten it – the virtuoso mile performance that Saturday in Maryland, the almost unknown freshman almost sprinting around the track, so far ahead of the competition that it was a time trial, and nearing exhaustion in the final meters as she dipped at an imaginary tape for a mind-boggling 4:49.37. 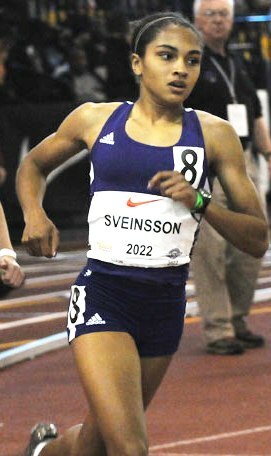 Although she had competed in Foot Locker the previous fall, for most national-level fans, that was your introduction to the talent, the determination, the magic of Chelsey Sveinsson: A performance in the 2008 NIN girls freshman mile – an event intended for developing runners – that easily exceeded the championship mark that weekend. It was a raw magic then, however, for the Greenhill School TX prodigy. And after a few very impressive early spring performances, including a 4:43.51 mile for 3rd at Penn, she disappeared off the map as injury forced her to curtail her season. By last October, though, it was clear that Chelsey’s return would be far more impressive. She had improved her endurance, and learned to pace herself and leverage her speed at the end of races. She roared through the cross-country season, winning the NXN South and Finals titles, and finishing an impressive fourth at Foot Locker Finals. After wisely taking a break during indoor, she has come back this spring with more 1600/mile times in the 4:40s, and 800s in 2:08-09, but most impressively has added the 3200 to her arsenal, clocking a US#1 10:12.11 at the Texas Relays. Leading the nation at the 1600, mile, and 3200, and with her eyes on NON and the World Youth team, she took a break from training to share some thoughts with DyeStat senior editor SteveU. Developing a "crush" on the 3200 at the Texas Relays. 1) Congrats on your season so far, especially Texas Relays – with the huge 3200 PR – and Penn! How would you assess your season so far, both in terms of training and racing? Training has gone very well this season. Thankfully, I have people on my school track team that push me every day and physically fit coaches that pace me through some of my workouts. Furthermore, last year I had trouble completing my workouts due to a hip stress fracture that affected my whole season. So this season I have been very grateful for being healthy and being able to at least complete my workouts. With my racing season still in its premature stage, racing has gone pretty well. I haven't had a race this season yet where I have been really pushed. However, that lack of competition doesn't downplay my success at the Texas Relays and Penn Relays. My times have consistently improved this season, but I am still looking forward to some races where I am the underdog. 2) With your success last fall in cross-country, and now your 3200, you seem to be really bringing the quality of your longer races up to the same level as your 800 and mile. Do you feel like more of a longer distance runner now, or is your heart still more in the 800 and mile? What kind of a sense do you have as to which distances are most natural for you … or that you actually enjoy the most? During the Athlete Forum at NXN, I remember Shannon Rowbury stressing the importance of having a range of distances to run, to not specialize in just one particular event. So this year, my mom, my coaches, and I decided that broadening my range to 3200m would only add to my abilities as a runner. I still love the rush of the 800m and the challenging mile, but I am also developing a respect for the 3200m that I never had before. Last season, the idea of running eight laps around the track made me sick – not because I thought it would be hard, but because I thought it would be boring. But since running the 3200 in the Texas Relays, I have developed a "crush" on the event. I am really looking forward to running it at NON. 3) It was obvious, beginning last fall, that you were starting to become more of a strategic racer instead of just someone who goes really hard from the gun, but I’ve heard the story behind that is a little more involved than I originally thought, that the injury you suffered last spring and summer had a lot to do with taking a different approach in the beginning of last fall. Can you talk about what that was like last year … having to deal with an injury that limited you, and having to reign things in … but then maybe whether it was a blessing in disguise? Chelsey meets the press Saturday at the Texas Relays. Finding out that I had a stress fracture was the most crushing moment in my season last year. Prior to the bad news, my training and my races had been seriously impacted by my injury. My practices were getting shorter and my time were getting slower. After realizing what type of injury it was, I had to end my season prematurely and assess with my coaches how we were going to approach the cross country season. In a sense, the injury was a "blessing," in that it forced me to reassess my training and that it occurred during my freshman year. But overall, like most injuries, it was really frustrating. The change in strategy is not related to my injury. With time and racing experience, I learned that racing is more than just running but it also involves strategy. After losing a couple of races in the last two hundred meters or so, you eventually take the hint. 4) Can you share some insight as to what your training has been like this spring? I heard you just completed your longest training week ever. Tell us about that and share some typical workouts that you do, both the harder workouts and the easier days. Compared to most distance runners, my mileage is unusually low, but it seems to work for me – especially during cross country season. Usually it is two hard workouts a week, with two days in between , and the rest of the week is recovery runs and cross-training. For cross-training, I swim in the morning three times a week and once in a while I hop on the elliptical or the bike. A hard workout that I've recently was this past Monday. I did 4x1000m at sub-5:00 mile pace, followed with 5x200m averaging under 30 seconds. An easier practice would be a 40-50 min recovery run. Over the hay bales at NXN 2009, en route to victory. 5) Most people now know that you were born in Iceland and your father is Icelandic, but not as many people know about your mom, especially her background as an athlete and in the military that led to the athletic lifestyle she’s obviously passed on to you. Can you tell us about her and about how she got you into different sports as a kid? My mom is the fitness director at the Greenhill School and she also is a fitness instructor at various fitness clubs in Dallas. With her military background and her passion for fitness, I have grown up in a household that stresses health and physical fitness. My mom has been to me the model of an athlete. Her stories of her experiences on the track and her innate passion of the sport definitely inspired me to run. However, she never cajoled me into the sport. Prior to running I did ballet, tap, soccer, volleyball, tennis, and swimming. It wasn't until my school offered cross country in 7th grade that I started running. 6) I’ve also heard about your swimming you do, and the fitness and core strength work your mom does with the team now. What are those aspects of your training like? Have you thought about doing competitive swimming in high school, or doing triathlons at some point? I have been swimming since I was 6 years old, but in 9th grade I decided not to swim competitively any more. However, I still love the sport and it's great cross training. Also for the past two swimming seasons, I swam for my high school. The training that I do with my mom is essential to my training. I can't go a week without visiting the fitness center three times a week. My weight training not only improves my strength and core, but also my relationship with my mom. It's one of the few times during the day that I get to talk to my mom. 7) When you’ve had so much success in your first two years, it would be easy to let things go to your head … but I’m told you are very humble off the track at school and with your team, and I’ve also read how you make sure you fit in with the rest of the guys and girls in the Greenhill program. Can you talk about what it’s been like mentally to deal with different levels of success and what’s enabled you to stay balanced about it? It's never been in my nature to gloat or be complacent, and I assume that's due to how my mom has raised me. In regards to the team, the cross country team – coaches included – is like a big family for me. It's the only team that I have a personal connection to. For the past two years, I've had senior Andres Ramirez, a member of the boy's XC team, to chase after in practice, so it's never like I was top dog. 8) Congrats on getting the invite to run in the 1500 at the Reebok meet May 30! This is your first time racing at a level beyond high school, right? What are your thoughts about this event and what kind of goals do you have for it? I am sooo excited for this race. My heart is still thumping. This is my first elite race. Of course I am nervous about this race, but it’s an excited nervousness, not an insecure nervousness. I don't have any specific goals yet for the race, besides getting a PR, but my number one goal is to make most of the experience and to have fun racing against some great runners. 9) Looking ahead to the rest of the season, what kind of goals do you have, time-wise and in terms of which national meets you’re running and how you’d like to be able to compete there? Have you also thought about longer term goals, like the next two years and then after high school? Do you have specific goals about times and/or records in high school, and then goals for college and beyond? I don't like to share time-specific goals, but in terms of this season my goals are to win my events at NON and make the World Youth team. I also don't like to look too far ahead in my running career, but I definitely have winning Foot Locker Nationals, and later, the 2012 Olympics in my sights. 10) Finally, tell us about Chelsey when she’s not training. I’ve heard not only that you’re a very good student, but that you have a love for singing and for dogs … can you tell us about those things? Academics are extremely important. I approach my schoolwork with the same vigor and passion as running. As for singing, I used to take voice lessons, but now I just sing when I feel inspired, whether that's in the school halls or at home in the shower with the radio blasting. At home, I have four dogs who I love dearly with all my heart. Their names are Axel, Herschel, Bruiser, and Frank. They all have different personalities that I just adore. When I am not busy with running or homework, I like walking with them in the neighborhood and playing fetch.